This is another winner from Pixar. I've loved every one of their films that I've seen and Brave is no different. Their animation gets better with every film - the technique, the detail, the movement, everything simply improves in their animation tech each time. This is also a great fairy tale. Yes, it's a pretty simple story. That's what a fairy tale is. 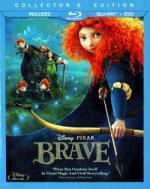 For those critics who accused this film of not being as original as Pixar's other films, I challenge them to find a female-centered children's film that A) isn't about romance and B) has a strong mother figure. Tough call, ain't it? Merida is a wonderful, strong character with plenty of flaws to make her believable. Her mother, Elinor, is the same - a strong, good role model in many ways, but with believable flaws. Great messages, marvelous animation, lots of fun. Recommended for anyone. Also on the disc, a wonderful, sweet little short called La Luna that was really great, and a bonus Brave-related short, The Legend of Mordu. I'd recommend watching La Luna before the film as it was shown in theatres, and Legend after, since it is a spoiler. There's lots of extras on the blu, but I didn't feel like pulling my player out so we just watched the DVD.